Total Water Use in the U.S. The water in the Nation's rivers, lakes, reservoirs, and underground aquifers are vitally important to our everyday life. These water bodies supply the water to serve the needs of every human and for the world's ecological systems, too. 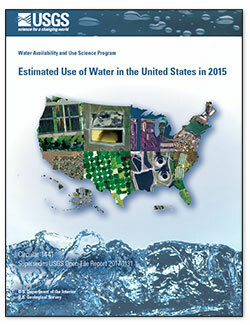 Here in the United States, every 5 years the U.S. Geological Survey (USGS) compiles county, state, and National water withdrawal and use data for a number of water-use categories. Thermoelectric power and irrigation remained the two largest uses of water in 2015, and total withdrawals decreased for thermoelectric power but increased for irrigation. Withdrawals for thermoelectric power were 133 Bgal/d in 2015 and represented the lowest levels since before 1970. Irrigation withdrawals were 118 Bgal/d in 2015, an increase of 2 percent from 2010 (116 Bgal/d), but were approximately equal to withdrawals estimated in the 1960s. Public-supply withdrawals in 2015 were 39.0 Bgal/d, or 7 percent less than in 2010, continuing the declines observed from 2005 to 2010. Self-supplied industrial withdrawals were 14.8 Bgal/d in 2015, a 9 percent decline from 2010, continuing the downward trend since the peak of 47 Bgal/d in 1970. Total aquaculture withdrawals were 7.55 Bgal/d in 2015, or 16 percent less than in 2010, and surface water was the primary source (79 percent). Total mining withdrawals in 2015 were 4.00 Bgal/d, or about 1 percent of total withdrawals from all uses and 2 percent of total withdrawals from all uses, excluding thermoelectric. Livestock withdrawals in 2015 were 2.00 Bgal/d, the same as in 2010. The top row of cylinders represents where America's freshwater came from (source) in 2015, either from surface water (blue) or from groundwater (brown). You can see most of the water we use came from surface-water sources, such as rivers and lakes. 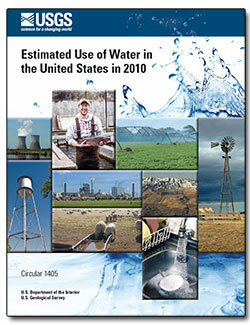 About 26 percent of water used came from groundwater. The pipes leading out of the surface-water and groundwater cylinders on the top row and flowing into the bottom rows of cylinders (green) show the categories of water use where the water was sent after being withdrawn from a river, lake, reservoir, or well. For example, the blue pipe coming out of the surface-water cylinder and entering the public supply cylinder shows that 23,800 Mgal/d of water was withdrawn from surface-water sources for public-supply uses (you probably get your water this way). Likewise, the brown pipe shows that public-suppliers withdrew another 15,200 Mgal/d of water from groundwater sources. Each green cylinder represents a category of water use. The industrial cylinder, for instance, shows how much groundwater, surface water, and total water was used inthe United States, each day, by industries. Data may not sum to totals because numbers are rounded. Data for freshwater withdrawals for 1980-2005 have been revised from original published values. Below are related science topics related to water use in the U.S.
How has America's water use changed over the last 65 years? Are we using more or less water, and are there trends for different kinds of water use? Groundwater is one of our most valuable resource—even though you probably never see it or even realize it is there. Groundwater is essential for irrigation and human use in many parts of the country. The use of groundwater in the United States in 2015 is described below. Do you wear contact lenses? If so, you most likely use a saline water solution to clean them. But what else do we use saline water for and do we really use that much? Read on to learn all about the use of saline water. The freshwater in the Nation's rivers, streams, creeks, lakes, reservoirs, and in underground aquifers are vitally important to our everyday life, and, indeed, to all life on Earth. It is likely the water you use at home is brought to you by a public water-supply system. These are agencies, such as you local county government, that find and get the water that is delivered to not only your home, but to many businesses and industries. Most of the population of the United States gets their water this way. Throughout the world, irrigation (water for agriculture, or growing crops) is probably the most important use of water (except for drinking and washing a smelly dog, perhaps). Irrigation water is essential for keeping fruits, vegetables, and grains growing to feed the world's population, and this has been a constant for thousands of years. Livestock water use is water associated with livestock watering, feedlots, dairy operations, and other on-farm needs. As the label in the grocery store says, "Farm Raised Tilapia Fillets" are for sale! Yes, aquaculture and fish farming are big businesses nowadays, and with the rising population of the world, more and more seafood will be grown in the future in aquatic farms. Below are publications related to water use in the U.S.
Below are multimedia items associated with water use in the U.S.